Umstead Park contains many trails. William B. Umstead State Park sits between Raleigh and Durham, and offers nearly 6,000 acres of hiking and biking trails, camping and picnic areas, as well as horse riding trails. It also offers historians a unique snapshot of North Carolina’s agricultural and sociological past. There are two entrances to Umstead Park: one on Highway 70 in Raleigh, called the Crabtree Creek entrance, and one on Harrison Avenue in Cary, called the Reedy Creek entrance. This is because at the time of the park’s opening in the 1930s, North Carolina was still heavily segregated. Two separate parks were created; the Reedy Creek park was for black citizens, and the Crabtree Creek park was for whites. In the 1960s, the parks were combined and named for William Bradley Umstead, who served as governor of North Carolina from 1946-1948, and whose efforts contributed to the restoration and preservation of the land. Despite this, visitors today must still exit Umstead Park through the same entrance they entered—though you can get from one end to the other on foot or bicycle, the two sections are not connected by any driving roads inside the park. Today, the Reedy Creek entrance is the most popular. Visitors to Umstead Park may encounter any number of wildlife, including deer, reptiles, birds, and insects, as well as a variety of plant life. Pine trees are prominent, and one popular trail is named the Loblolly Trail after the variety of pine. Fishing is allowed, but consumption of fish caught in the area should be limited. The land, which was found unsuitable for farming due to its erosive properties, was originally primarily used for hunting and lumber, as well as milling. Decades ago, an entire community dedicated to milling wheat and corn used to exist in the park. Ruins from several of those mills, most notably the Company Mill, can still be seen by hikers today near the creeks that run through the park. 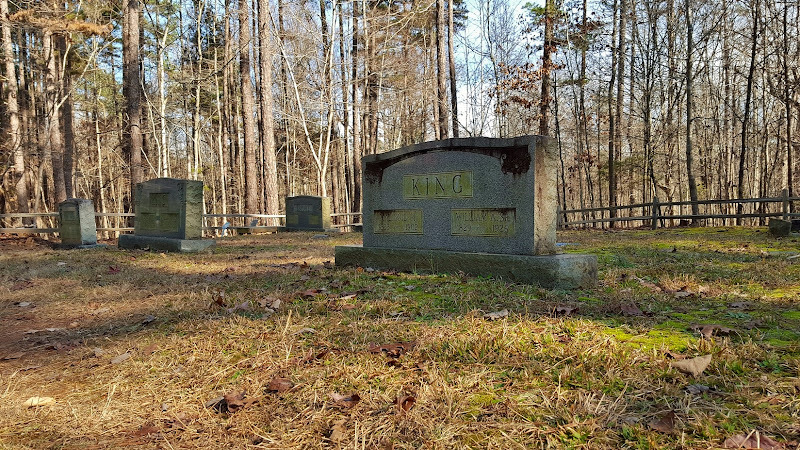 One of the cemeteries in Umstead Park. Evidence of homesteads in the community is also easy to find at Umstead Park. Piles of rock, patches of tulips, and the occasional fireplace are all indicators of the once thriving settlement there. Several cemeteries containing the remains of the settlement’s residents are also accessible from hiking trails; most of the hiking trails in use today were cut in the early 19th century as narrow roads suitable for walking or travel on horseback. Umstead Park is open year-round from 8:00 AM to 9:00 PM in the summer, and until 6:00 in winter. Entry to the park is free, but campsite and boat rentals require a fee.